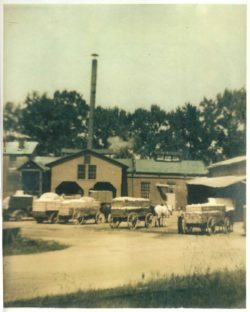 Williamston Gin & Lumber Co. was founded in 1925 by J.L. Simpson. 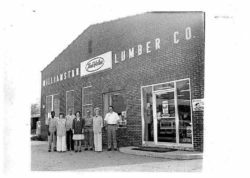 The company’s name was changed in the early 1950’s to Williamston Lumber Co. by M.W. Simpson, J.L.’s son, to reflect the company’s move away from cotton ginning. As the company continued to evolve into the 1970’s, the direction of the company changed again from a building supplies outlet to primarily a hardware and related lines company. The company name was changed again to Williamston Home Center, Inc. in 1976. The company is currently owned by Jim Simpson, the son of M.W. Simpson and the grandson of J.L. Simpson. 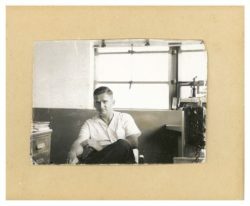 Jim’s father operated the business until his death in 1966. 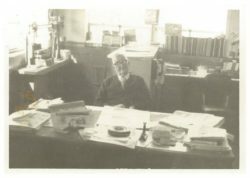 Jim’s mother, Helen Simpson, then continued the business after her husband’s death, at age 41, until their son Jim returned from earning a degree from Clemson University in 1972. Helen remained active in the family’s business until she retired at the age of 82. Jim’s son Mike Simpson is now the fourth generation of the Simpson family to continue in the business. Mike graduated with honors from Tusculum College in Greeneville, Tennessee with a degree in Business Administration. He currently serves as President of the company and is in charge of all its day to day operations. Although the corporate name of the company has remained the same since the change in the 1970s, the D.B.A. name has changed twice. From 1970-2004 the company operated under the name, Williamston True Value Hardware. Then in 2004, when the co-op affiliation was changed from True Value to Ace Hardware, the D.B.A. name was changed to Ace Hardware & Rental. The company has made many changes through the years to serve the evolving needs of the communities it serves, including moving into a new 20,000+ sq. ft. location in 1988. In 2017, that location was completely remodeled to better serve the changing needs of our customers. Changing from a cotton gin, lumber yard and general building supply outlet, the company has evolved into a complete modern hardware store with an extensive line of rental equipment. The one thing that has remained constant throughout the company’s 90+ year history is its commitment to honesty, integrity, and outstanding customer service. Early in 2014 the company’s management team decided it was time to look for ways to expand the company. It was determined that the best way to do that would be to open an additional location. After evaluating a number of possible locations within the company’s extended trade area, it was decided that Honea Path, SC, and its surrounding communities, offered the company the best opportunity to meet the needs of a then underserved area. With that decision, Honea Path Ace Hardware was born. 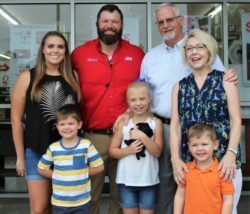 The Simpson family is humbled by the overwhelming support for that store by the Honea Path community and looks forward to that continued relationship for many years to come.